"At Gila, there were 7,700 people crowded into space designed for 5,000. They were housed in messhalls, recreation halls, and even latrines. As many as 25 persons lived in a space intended for four." 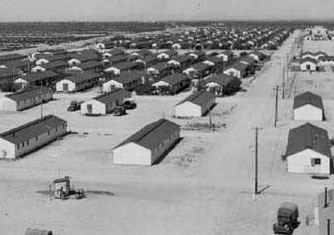 - Personal Justice Denied: Report of the Commission on Wartime Relocation and Internment of Civilians. "In desert camps, the evacuees met severe extremes of temperature. In winter it reached 35 degrees below zero, and summer brought temperatures as high as 115 degrees. Rattlesnakes and desert wildlife added danger to discomfort." "When we first arrived at Minidonka, everyone was forced to use outhouses since the sewer system had not been built. For about a year, the residents had to brave the cold and the stench of these accomodations." Opened July 20, 1942. Closed November 10, 1945. Opened October 6, 1942.Closed June 30, 1944. Opened March 21, 1942.Closed November 21, 1945. Opened August 10, 1942. Closed October 28, 1945. Opened May 8, 1942. Closed November 28, 1945. Opened September 18, 1942. Closed November 30, 1945. Opened September 11, 1942. Closed October 31, 1945. Opened May 27, 1942. Closed March 20, 1946. Copyright Satsuki Ina 1999. All Rights Reserved.